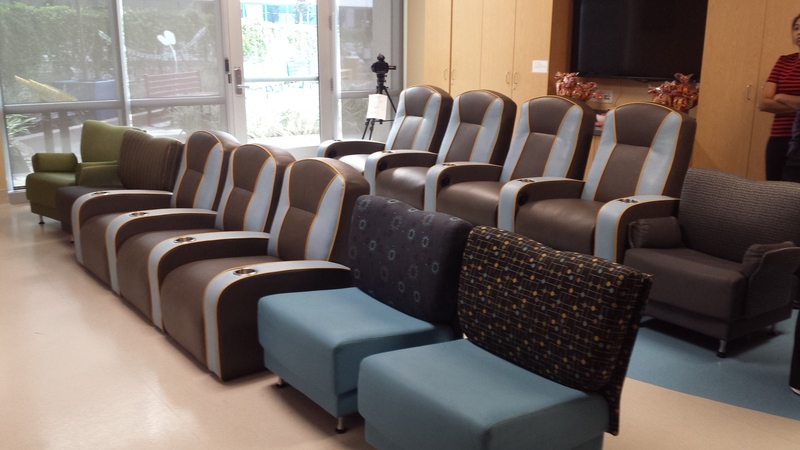 We here at Seatcraft are extremely proud to showcase the seats that we recently donated to the Children’s Hospital Of Orange County here in Orange, California. The hospital was looking to design a movie theater on their cancer floor, and contacted leading companies in the area looking for donations of money and equipment to help realize their dream. It was a sign of our prestige in the area that we were contacted regarding the donation of home theater seats, a request we here at Seatcraft were more than happy to fulfill. The unveiling of the home theater room occurred on October 16, with members of our staff in attendance. The front of the theater is dominated by a large flatscreen on which the children can see films that are still in their theatrical run, thanks to a special arrangement. 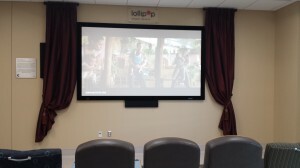 The screen is flanked by beautiful velvet burgundy theater curtains, while the rest of the room has a teal design scheme that extends from the floor to the chairs themselves. A popcorn machine stands in the back, ready to bring a fully authentic movie theater feel to the proceedings. 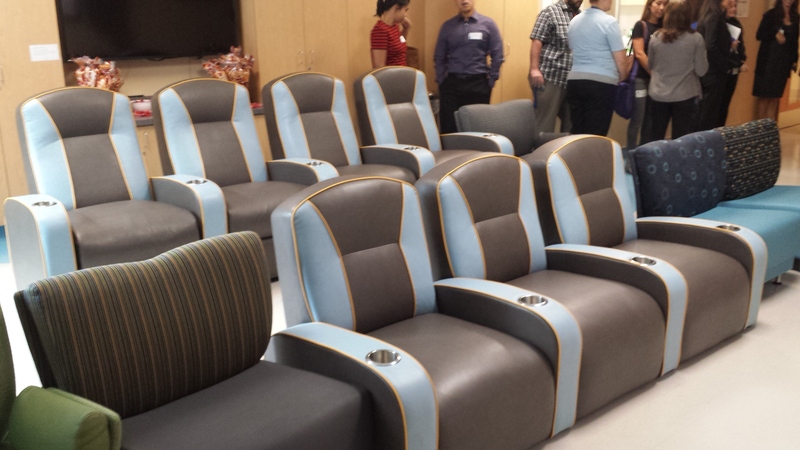 Seatcraft initially donated seven chairs to the project. The Rapture model in our exclusive Majestic series is highlighted by a smooth Leggett-Platt recline and high-resilience foam cushioning. There are three front seats and four back seats, with custom-built heights designed to accommodate a child’s smaller frame. The seats are also specially built to allow the back row the height needed for a clear view of the screen, without the need for risers. Stainless steel cup holders replicate an experience just like that of the movies, providing a handy spot to keep the child’s drinks secure and within easy arm’s reach. 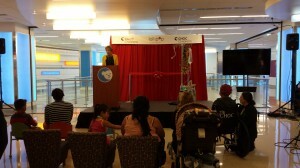 Both the staff at the hospital and the children themselves were delighted with the setup, as the new Disney feature “Alexander and the Terrible, Horrible, No Good, Very Bad Day” was screened on the day of the unveiling for their enjoyment. The Children’s Hospital was so impressed with our donation, that they have asked for two more seats which we are in the process of custom-building for them. It was a truly heartwarming experience to be able to attend the opening day of the theater room and see the smiles on the faces of these children, and know that we had contributed our small part to bring some happiness into their stay at the hospital. Thanks go all-around to everyone who helped make this a special event, with many more movie nights ahead! This entry was posted in Uncategorized on November 3, 2014 by seatcraft.